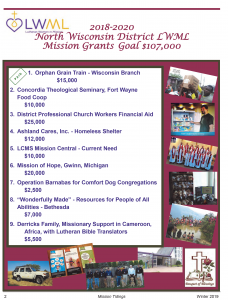 Mission Opportunities Short Term (MOST Ministries) is a Recognized Service Organization of the LCMS. Some of our NWD LWML women have served on its eyeglass and water teams in Central America. MOST shares the Gospel both here in the U.S. and internationally through humanitarian outreach and personal witness to people in communities with a need. Its min- istry opens doors for local national church workers to evangelize and share Jesus and His saving love. The staff shared information about its programs. We were truly amazed to see thousands of pairs of eye– glasses neatly boxed and ready for distribution. To get them ready, eyeglasses must be checked, lenses removed, lenses cut and refitted, then washed, labeled and packed. We joined local volunteers to help in this process. make this important ministry possible. We heard inspiring stories of how the Spirit has worked to bring people to Christ. We have a mighty God! For more information or to sign up for a mission trip, go to www.mostministries.org. CONCORDIA UNIVERSITY SCHOOL OF NURSING in Ann Arbor was truly memorable. Dean and associate professor Cindy Fenske led us through the state-of-the-art facility. Entire wards are set up to mimic real hospital units – complete with functioning mannequins that can be programmed to display symptoms; they bleed, groan and even have babies! Students are able to deal with true-life situations and their activity is videotaped for classroom viewing and comment. They work with other departments at Concordia to program for large-scale emergencies such as mass shootings and bio-hazard events that include students from law enforcement, hazmat, lawyers, and physicians who work together to handle the situation. Dean Fenske stressed the importance of the school’s mission to educate students with Excellence, Integrity, Compassion and Service all in the name of Jesus. Students from the college regularly partner with MOST Ministries and join medical teams to serve people in rural areas who do not have access to health services. To find out more, go to www.cuaa.edu. staff in leading the children in Bible lessons, crafts, music, lunch, and games. We had the opportunity to share Jesus’ love. Executive Director, Patti Jacques, took the group to their warehouse where we saw how the organization has networked with business, civic and church organizations, which provide free goods for this ministry. Find out more at www.giftsforallgodschildren.org. People of the Book Lutheran Outreach (POBLO) is a Recognized Service Organization of the LCMS and brings the ministry of the Gospel to Muslim populations both here in the U.S. and overseas. We heard the incredible stories of two courageous women who heard the Good News of Salvation, and in spite of bodily injuries and the threat of death from family members and friends, converted to Christianity, were rescued by Christians and brought to this country. They left family, goods, jobs, and friends because of their powerful conviction that to know Christ is to know the Truth. They now share their powerful testimonies with church groups and conventions about a God who loves them unconditionally. They serve the immigrant community in Detroit through Friendship Centers where they offer sewing classes, ESL, tutoring, and counseling, as well as helping immigrants connect with resources and churches. We were able to visit an ESL class with Christian Albanian refugees who fled their country because of persecution. The staff of POBLO is eager to share information about its ministry with your church. They can be reached at www.poblo.org.